ChazmanianDinkle: Interview with Antoine RJ Wright! Interview with Antoine RJ Wright! 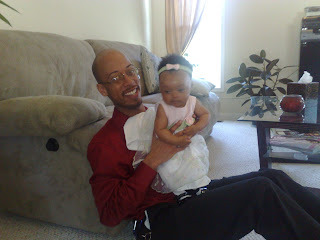 I had the wonderful opportunity to interview Antoine RJ Wright , founder of Mobile Ministry Magazine and a forerunner in the field of mobile technology and its integration into evangelism (seen below holding a baby, because he's just that kind of awesome). Below is the interview, which was done via email. I hope you enjoy! What types of devices do you think we can expect to see in the not-so-distant (5 years or so) future? Are there any technologies out now that you think in particular will fail or become more popular? We will continue to see mobile devices take on more shapes and forms, but the big thing will be in device sustainability and efficiency. If you will, mobile devices will follow the current trends that other industries are in respect to being clean, made from renewable, and using less non-renewable resources. Concepts like the Nokia Morph might be more popular in some Westernized, urban areas, but by and large, the simple mobile (think Nokia 1100) will be the pick of the litter for most. How do you think that the advancements in mobile internet, in particular 3G and services like WiMax, will affect how we look at and utilize the internet? Do you think that this everywhere-internet will change how we do ministry at all? If so, how? Its already changing ministry; but like all tech, things take time to be used and seen for their relevance. I see the Internet becoming more mobile, more social, and less tied to sit-still situations. Internet won't be everywhere, but those places that it will be will have enriched enablers to enable people to do more. My hope is that the Body will follow; I'm not sure that we are at the point that we have caught up to current uses to even say that we will change further... yet. What steps could the church as an organization take to better utilize mobile technology; as well as utilizing internet services, etc.? How far do you think they should go (incorporating it into worship service, keeping track of leaders or evangelistic growth, etc.)? As with any technology; the key is to understanding its relevance (technology is only relevant when its personal) and its implications (there are positive and negative implications to mobile/connected technology. People should only use it as far as they are willing to understand both its relevance and implications to the Body as a whole. Only then can it be something that adds to the Body. By the way, when we don't understand the basics of 1 Cor 12-14, we don't need to look to tech at all, but to ourselves as "we" are the people that move ministry, not tech (its only a tool). Furthermore, what do you think we as individuals can do to utilize these new technologies in aiding our own witnessing and personal evangelism? Be slow to speak; quick to listen, and apt to teach. What are some things you think that Christians, whether individual or as a whole, can do with new and emerging technologies in order to spread the gospel to the lost? Perhaps we could utilize them so as to reach those who have either not heard it or do not have easy access to Christian materials. How do you propose we could do this? There was a time where this question was the impetutus behind what I wanted to do (hence starting Mobile Ministry Magazine). However, I don't feel that way. Technology should be used as one of many enablers to help us share and live out the Gospel amongst others. And contrary to popular belief, we don't need this tech in order to get others Christian materials, we need a heart directed towards serving one another. The tool will take care of itself. That all being said, things that can be done include building wells, schools, being elected into office, being stewards over our riches/wealth here, and modeling appropriate use to those in our immediate social circles. In doing this, we are being that light that will reach towards others; again, its us, not the tech that move in line with God's heart for His people. In what ways could church leaders use this technology to help them with their jobs? Maybe organize and plan events and schedules, as well as other things? What do you think we/they could do, using this technology, that we/they are currently not doing; whether it be to make duties easier, or to utilize it in a way which they could accomplish something they would not have been able to previously? Obviously Christians are not the only people who will be using this new technology. What should we expect to see as far as opposition, and how should we approach it? How do you think that anti-Christians would/could do with this technology to potentially hinder or threaten our ministry efforts? Censorship isn't a religious topic as much as it is a political one. It happens now, and the best that anyone can do is observe the laws that are in place and take preventative measures for their own data when engaged with those organziations and governments which think/act otherwise. As for what can be done, if you can think about it. Its already been done. Do you think that most Christians are underutilizing the technology available to them right now? What about the church as a whole? How do you think that the older generation will approach this new technology? Do you think they may be slow to learn how to use it, or maybe even opposed to it's use by the younger generation? I know that as someone born into the digital generation I naturally am much more receptive to and quicker to learn about new technology than people in the older generations typically are. I would recommend the resource Born Digital as that would explain things better than I. But this is the case with every generation no matter what kind of new technology comes along. Those who are born into something have it a lot easier than those who were not. I am definitely more tech-savvy than your average person, and therefore I am much quicker to jump on brand new technologies than most people. Going along with my first question, how long do you think it will be until the average person, not just the tech-savvy, are equipped with personal portable computers that they are going to take with them wherever they go? There are over 3 billion people in the world that own a mobile phone. Its already happened that personal computers are being taken in by everyone. If I may state my own opinion, I believe that smartphones such as the iPhone and G1 are definitely headed in that direction. I strongly believe that within the next 5 years we will see smartphones that are as powerful as netbooks are today, and maybe even more so. Within 10 years for sure, I believe that there will be phones more powerful than anything we have today that are as cheap as a dumbphone. Heck, that's considering we still use phones and don't just all get cranial implants (haha). Your thoughts? Smartphones are already as powerful as netbooks; whether people use them as such is a different observation. Smartphones are also as cheap as dumbphones already (Palm Centro, Benq E72, etc. ); whether people use them as such are a different story. Mobiles are tools for connecting and aggregrating information. People are still doing the same things, just with different tools. Whether we use those tools to their abiltiies or our needs depends on the person. Hence the term "personal" computing. Technology is only relevant when its personal; after that, its excess and for many, excess with computer technology is easy to recognize, and easier to run away from. If people are taught how to use it in ways that are relevant and cost effective to their lifestyles, then they will not only use it, but their lives will prove as examples to others. Any final thoughts or things you would like to add to the above statements? So that Concludes the interview. I hope you enjoyed this, and I will definitely post my paper when it is finished. 0 comments on "Interview with Antoine RJ Wright!"